Pirates Smuggler's Paradise slot is a game I was optimistic about upon playing for the first time but alas soon transpired to be one of the most pointless online slot creations ever mooted. That's how I saw it and maybe you'll disagree slightly when I've explained it a bit more, but 'slightly' is as far as I'll go here! There has been a string of dreadful pirate-themed games lately such as Red Tiger's Piggy Pirates and Nextgen's Wild Plunder and somehow Yggdrasil has contrived to make one even worse. We get an irritating sea shanty classical soundtrack here with our reels set over the sail of a ship moored off a tropical island and a stupid grinning cartoon crab on the deck, but it gets even worse later. I would usually make a crack around now about how much of my bankroll I'll get back from the game, but I'll gladly lose it all to escape with my sanity! We have a 5x5 grid here and get cascades although the reels do spin initially. There aren't pay lines as such as we need to trigger a cascade in-play feature by landing 6 or more adjacent tiles. These remain in the grid while more drop down from above and so-on until no more similar tiles appear. As we fill the 5 reels, almost like dropping counters into the Connect 4 game, we can line up rows to get an increased multiplier which begins at 2x for filling the bottom 2 rows up, 3x for 3 rows, 5x for 4 rows and finally 10x for filling the grid with 25 identical icons. If you don't get a multiplier lit you simply get a cluster pay for the amount of adjacent tiles. The tiles pay for a basic 6+ adjacent cluster up to a full grid of 25 so there is a value given for just one symbol, multiplied by at least 6 for the qualifying cluster and multiplied by any multiplier you may climb up to. So to fill the bottom 2 rows with 10 tiles of the top-paying Red Pirate for example would be 10 x 20-coins x 2x multiplier so 400-coins or 40x your 10-coin bet. 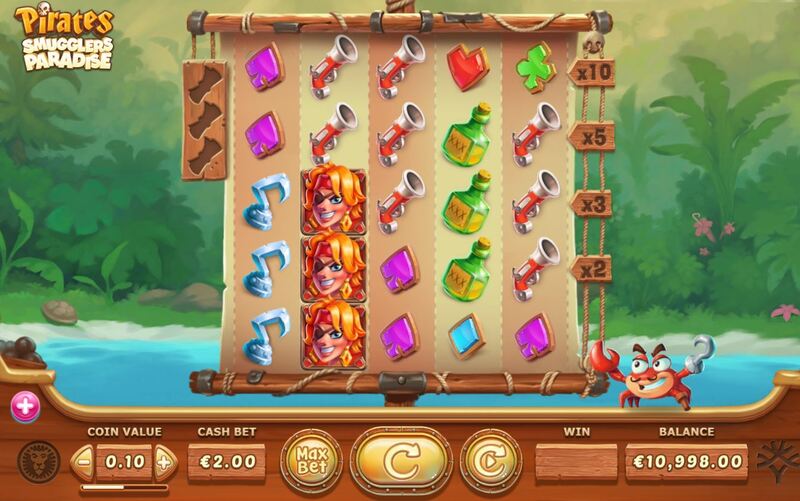 The Red Pirate therefore pays 20-coins each tile used, Pink 15, Green 12 and the Parrot 10. The medium-value symbols are Blunderbuss, Cutlass, Brandy and Hook at 8,7,6 and 5c-oins respectively with 4 card suits all paying 2-coins. If you land 2 of the 6-symbol clusters in one spin the lower one upgrades to the higher symbol which in the case of the card suits is absolutely pointless as they pay the same amounts! Multiplier Madness - any row-multipliers you get to during the spins accumulate as you go and all the round's total is then subject to it. High Seas - all low and medium icons removed from reels which despite your possible assumption actually seems to make wins harder to hit! Win Fall - 2 winning symbols are added to the grid after every successful cascade which adds at least one more symbol. Increases your chances of bigger blocks to multiply the tiny tile values with. 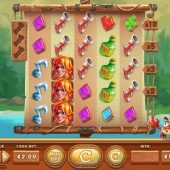 Pirates Smuggler's Paradise slot is one of those games which had some imagination applied but was terribly executed to create a slot with laboriously slow spins when the symbol accumulator is triggered and no realistic chance of big wins. The low volatility ruins it despite the good 96.30% RTP, with a maximum win of 500x for a full grid of Red Pirates at 10x. The clue to this lies in the intro screen which screams WIN UP TO 5000 COINS! whereas on may games this would be WIN UP TO 5000 X BET!